Are you someone who spends a lot of time in the woods? Or are you someone who prefers a calm, serene beach instead? Then you must experience lying down in a hammock in your favorite outdoor environment. 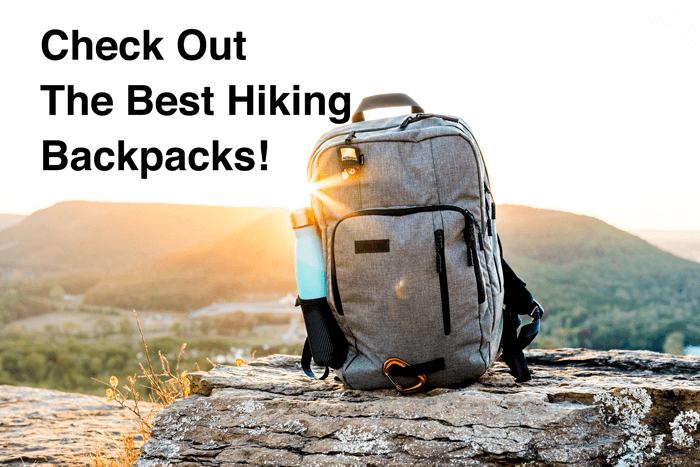 Not all hammocks are built equal, and in this article, we will find out why the Camp Is Easy Single Camping Hammock is one of the best hammocks for harsh outdoor environments. The Camp Is Easy Single Camping Hammock holds a stupendous rating of 4.8 in Amazon.com. However, it is not its price that dictates its high ratings; it is the impressive list of features that take it to stellar heights. Here are the some of the brilliant features of this amazing camping hammock. Thinking Camp Is Easy? … Get it on sale here. Dimension: Camp Is Easy offers their camping hammock in 2 sizes, the single camping hammock with dimensions of 55 inches X 106 inches (140 cm X 269 cm) and the double camping hammock with dimensions of 79 inches X 118 inches (200 cm X 300 cm). However, in this article, we will be focusing on the smaller option. The single camping hammock is large enough for most people and can also squeeze in 2 people of slender build. This camping hammock is quite sturdy and capable of supporting 400 lbs (181 kg) of weight. On top of that, it folds down to a ridiculously tiny storage pouch once you are done using it, and the entire hammock only weighs 1.7 lbs (0.78 kg)! Material Quality: When it comes to the subject of material quality, the Camp Is Easy Single Camping Hammock takes the cake. This hammock is made of a tear resistant nylon material. The special parachute fabric is woven using a ripstop technique to make it completely resistant against knives and other sharp objects. Moreover, this material is not only highly durable but also this fabric is one of the most comfortable materials to lie down on. Durability: The Camp Is Easy Single Camping Hammock absolutely destroys the competition when it comes to durability. This is surely one of the most durable camping hammocks we have used till now. The tear resistant fabric holds its own against sharp knives. Moreover, the multi-loop straps offer great support and instill a sense of confidence when you tether it to poles or tree branches. 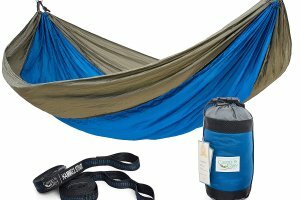 This camping hammock is perfect for any outdoor environment. Versatility: This camping hammock scores big on versatility as well. In fact, it outscores the competition because of its tear resistant parachute fabric. You can use this hammock in a wide range of outdoor environments. Moreover, this camping hammock can double up as a blanket as well. You can spread this over any surface and not have to worry about snagging it against a sharp rock or stick. Last but not the least, you can tether the hammock close to the ground and use it to seat 3 or 4 people comfortably. In fact, that is a great way to relax with your friends and family. The Camp Is Easy Single Camping Hammock comes with a unique compression bag which manages to hold the hammock, straps, and carabiners inside it. Moreover, this handy storage pouch is extremely compact, making it a breeze to carry around. Where do I get the best deal? Get your Camp Is Easy hammock here! If you are still not sold about this hammock’s stellar capabilities, we believe that the 5-year product warranty coupled with the impressive customer support will surely seal the deal. On top of that, you get a Money Back Guarantee as well! This brilliant camping hammock aces every test except this one. It is only available with a single blue and gray color option. If your favorite color is anything but blue, you will be disappointed.